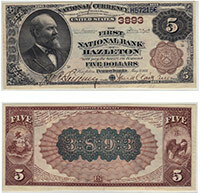 There are two types of 1882 blue seal national bank notes. The back either says five dollars or it says 1882 - 1908. The value of these notes is really just based on the condition and bank of issue. Some can be worth as little as a few hundred dollars. The rarest notes usually top out at a couple thousand dollars. Please contact us for details. Don't forget to check the serial number. Number 1 notes always sell for nice premiums.